The Human Rights and Human Diversity program is pleased to announce Rachel Pearsell as the 2016-2017 winner of the Best Essay Award in HR402 Cross-Cultural Perspectives on Human Rights. 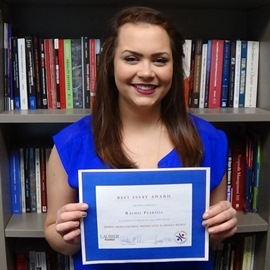 Rachel received this award for her essay entitled, "The Harmful Traditional Practice of Breast Ironing in Cameroon, Africa"
HR402 functions as the Human Rights & Human Diversity program's capstone course. This seminar course provides students an opportunity to apply the knowledge and skills they have developed in their many courses by focusing on a topic of interest to them.